Minimum 2 Maximum 12 people. 4-6 hours average day covers between 7 and 21 kilometres mostly on beaches. Hotels with dinner (often extravagant), breakfast and packed lunch. B&B's are self catering with option of using hotel dining rooms if required. Transfers to departure point provided. N2 turnoff at either Butterworth (Mazeppa,Seagulls,Trennerys) or Idutywa (Kob Inn). 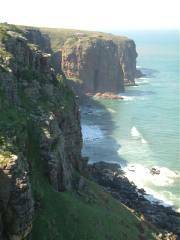 Transkei wild coast hikes 4-6days. The full trail extends along the lower Wild Coast from Qora Mouth (Kob Inn) in the north to the small town of Cintsa in the south. The first 3-4 days of the trail lies to the north of the Kei River in what was formerly known as the Transkei, while the last section extends along the eastern Cape holiday coast north of East London. The hike takes in some of the most unspoilt and picturesque sections of our coastline. Long sandy beaches, rocky points and cliffs, beautiful lagoons and estuaries and pristine coastal forests characterise this section of the Wild Coast. The Wild Coast, especially in the Transkei is a magical place where you will truly feel at one with nature as there has been little or no 'development' along the coast. Because of the terrain and access problems from the interior, most of this coastline can only be seen by those who are prepared to hike it! You will see little evidence of anyone else having been on on the beaches, just footprints and the occasional small boy herding cattle. The rural scenes have remained this way for ages so that you feel that you have stepped back in time. The trail is not marked in the Transkei section and a guide is normally required for first time hikers to show the best route, although as most of the walking is done along the beach and coastline it is not likely that you will get lost! It is important though that you time your day's walk to co-incide with the tides so that you walk on the hard sand with a receding tide and reach the river mouths at low tide to make the crossing easier. Your guide will assist you with this and show you the best place to cross over. Kob Inn to Mazeppa 6km - the shortest stretch accross the Qora river and beneath huge dunes. Mazeppa Bay to Wavecrest 21 km - the longest stretch but easy walking along sandy beaches. Wavecrest to Seagulls/Trennery 14km - rocky headlands, ship wrecks and river crossings. Seagulls to Morgan Bay 12km - crossing the Kei river and a walk through coastal forest. Morgan Bay to Haga Haga 16 km - spectacular cliffs and shelly beaches. Haga Haga to Cintsa 17km - a rocky wavecut platform and a long beach walk. This trail option has been designed for those who want to walk the trail in style and in comfort without the inconveniance of carrying a heavy back-pack. You will have the freedom to focus on the magnificent scenery that you will pass through with the knowledge that the end of the day you will arrive at a comfortable hotel to spend the night. The standard "hotel-hopping" trail is for 4 days and 5 nights, usually starting at Mazeppa Bay hotel and walking south to complete the trail at Haga Haga resort. Distances between hotels should allow one to have the time and comfort to soak in the atmosphere and enjoy the pleasures of the day's walk. With a reasonably early start and allowing for a leisurely lunch break you should reach your next destination by mid-afternoon. The trail can be customised for different requirements. Some may prefer to start at Kob Inn which is 6km further north on extend the trail further south to Haga Haga and Cintsa. After a long day's hike, hikers may like to extend their stay to 2 days at any of the hotels to relax and partake in local activities. Please avoid travel bookings during the peak holiday seasons (Xmas, Easter and long weekends) as the hotels are reluctant to accept hikers for one night stays. The best time to hike the Wild Coast is generally March to June or September/October. This is new trail option introduced for the first time in 2005. It is aimed at more budget conscious hikers who would like to do the same trail at a reasonable cost but without having to pay for full board hotel accommodation. By making use of self catering and B&B accommodation it is still possible to hike much of the same route and to offer the same standard of service at a much reduced price. We have also managed to economise on the cost of this trail package by not using a guide (simply follow the Strandloper trail markings), by restricting the trail to "out-of-season" hikers and offering it as a 4 night package - although extra days can always be added if required. In no way though does this compromise the comforts and conveniance of a trail that offers you comfortable overnight stopovers with private bedrooms and bathrooms, with luggage transfers between overnight stays and collection transport at the end of the hike. In the Transkei section of the hike, you will be accompanied by a local guide who is a member of the community and well acquainted with the route. Once you cross over the Kei river the guide will direct you to the start of the well-marked Strandloper trail which you can follow to Morgan Bay, and therafter onto Haga Haga and Cintsa for those going the whole distance. Please note that, unless otherwise arranged in your trail package, you will be required to carry your own personal items between the hotels. Most hikers are happy to walk with a light pack (not exceeding 10-12 kgs in weight), but for those who wish to walk unhindered, it is possible to hire porters at the hotels. Please organise this with the hotels in advance or the evening before (not on the morning of the hike), and pay the porter in cash at the end of the day's hike. In the Eastern Cape sections, the hotels can arrange for a vehicle to transport your packs onto the next hotel in line. Please ask for this when you organise your trail itinerary.